This tutorial explores the Bookshelf sample app and discusses how each feature of the app is implemented using technologies and services that GCP provides. 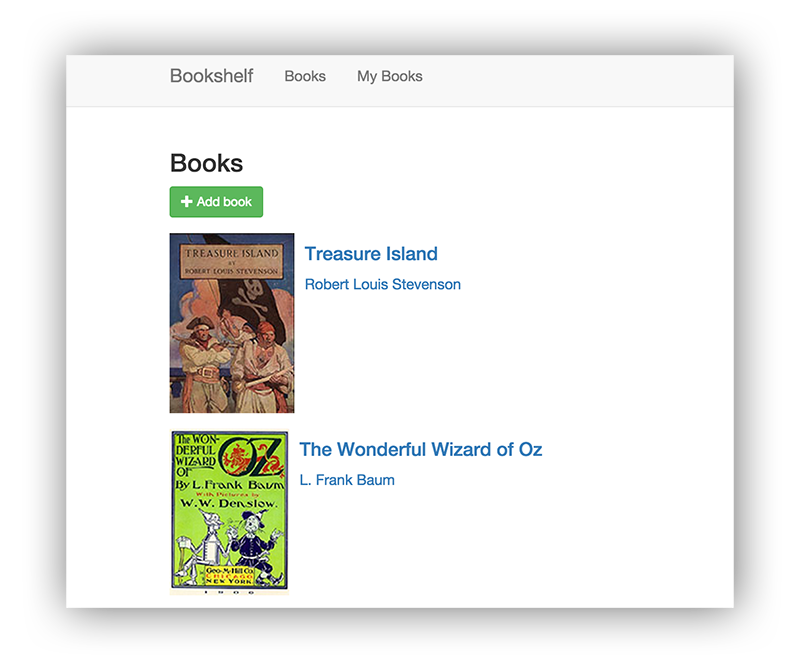 The Bookshelf sample app is based on the Flask web application framework, but the concepts and technologies explored are applicable regardless of which framework you use. You can implement this app in another web app framework of your choice, for example, Django. Throughout the tutorial, the code follows best practices and common patterns for larger Flask apps. Notably, the app uses blueprints and app factories. If you are unfamiliar with these patterns, we recommend reviewing the Flask documentation. View the list of books. Add books to the list. Remove books from the list. Upload cover images for books. Sign in with a Google Account and view the books that they added to the list. Clone or download the sample app. Build the app and run it on your local machine. Deploy the app to App Engine. Walk through the sample code. Learn how the app stores structured data. Learn how the app stores binary data in Cloud Storage. Learn how the app authenticates users. Learn how the app creates event logs that are visible in the Google Cloud Platform Console. Learn how the app uses Cloud Pub/Sub to send tasks to a background worker. This tutorial uses billable components of GCP, including Compute Engine. This tutorial has several steps, and each step is documented on its own page. The final page of the tutorial includes instructions for cleaning up resources so you won't continue to be billed for GCP services. If you decide not to complete all the steps of the tutorial, see the cleanup instructions on the final page. Create a GCP project, create an App Engine app, and then enable billing in that project. When prompted, select the region where you want your App Engine app located, and then enable billing. After your GCP project is created, the Dashboard opens. Enable the Cloud Datastore, Cloud Pub/Sub, Cloud Storage JSON, and Stackdriver Logging APIs. Download, install, and initialize the Cloud SDK. Acquire local credentials for authenticating with GCP services. Verify that your default project is correct. If the project ID listed in the output isn't the project that you intended to use for this tutorial, set the project. where [YOUR_PROJECT_ID] is the ID of the project that you created or chose to use for this tutorial. Note: You can create Cloud SDK configurations to set configuration properties, such as a GCP project ID. You can switch between those configurations each time that you use the gcloud tool. For more information, see Managing Cloud SDK configurations. This tutorial assumes that you are familiar with Python programming and that you have a Python development environment set up. If you don't have Python installed, see Setting Up a Python Development Environment. Even if you already have Python installed, it's useful to review the setup instructions to ensure that you have the latest Python tools. The Bookshelf tutorial has several parts that demonstrate how the sample app uses various GCP services. The structured data part of the tutorial demonstrates how the sample app stores book information in a SQL or NoSQL database. The sample app's web page displays a form where the user enters the title, author, description, and publication date of a book. The app stores this information in a database so it can be retrieved later for viewing or editing. For this step of the tutorial, you have your choice of three databases: Cloud SQL, Cloud Datastore, or MongoDB. After you complete this step with one of the databases, you can move on to the next step. The Cloud Storage part of this tutorial demonstrates how the sample app stores binary data in Cloud Storage. On the app's web page, the user can specify a cover image for each book. The app stores the cover images in a Cloud Storage bucket. The authorization part of this tutorial demonstrates how the sample app provides a sign-in flow for the user. When a user is signed in, any books that the user enters are associated with the user. Signed-in users see their own books and books that are created by anonymous users. Other users can't see books that are created by a signed-in user. The logging part of this tutorial demonstrates how the sample app writes logs that are visible in the Google Cloud Platform Console. Logs of this type can provide diagnostic information during app development. The Cloud Pub/Sub part of this tutorial demonstrates how the app uses Cloud Pub/Sub to send tasks to a background worker. The worker gathers information from the Google Books API and updates the book information in the database.